But a night in with JUST the girls? No kids running in with a "Mommy! Help me with this juice box!" or "Mommy... can we have real water for our tea party?" or a "SHE'S COPYING ME!!!" to interrupt our adult conversations? I honestly can't remember the last I've done that (here or at someone else's house). 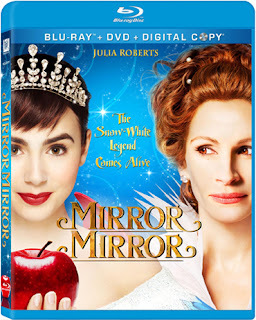 So... when I was contacted and asked if I wanted to try to plan a "spa themed" girls' night in with a DVD viewing of "Mirror, Mirror"... it took me about 1/2 a second to reply with an "Absolutely sounds like an awesome idea!" Now I'm trying to plan. And you know what? It's hard! It's Summer. It's 4th of July week now. 1/2 of my friends are off on family vacations this week. And then when they come back we're going to the shore. And what exactly do I do with Zoe and Ana while I have 4 or 5 friends sitting on the couch in our TV room? How do I make them not interested in a Snow White movie? Will they stay in bed... or will we get interruptions? And Nick is going away all week for work. Do all moms have this much trouble trying to plan a simple girls' night in? Or... do moms just give up on an occasional girls' night in? I'm also having trouble with the "spa theme" part. How "spa" should I attempt to go in my TV room? I'm starting to think I feel kind of silly doing face masks or pedicures. That's not really my friends' thing. Do you know what I mean? I almost feel odd asking them to do that. Can my "spa" just have something like... apple sangria (totally appropriate for Snow White right?) and a cheese and fruit platter? Something more? Maybe fuzzy socks and our feet up on the coffee table? No wonder I haven't had a girls' night in for ages. Disclosure: I was contacted by ThinkJam and asked if I would considered having some friends over to watch Mirror, Mirror. I was sent a copy of the movie, along with some party favors (movie themed water bottle, nail file, nail brush...) to share with my guests. The party planning and opinions were all my own.